The word “ikat” comes from the Indonesian word meaning “to bind or tie”; ikat textiles are the result of a process where the design is created by the tying off of specific unwoven threads in order for those areas to resist the repeated dye baths that are necessary to get the desired depth of color. Then subsequent steps of tying off different areas to create the various areas of color that will be in the finished cloth. Finally, after many steps of tying, multiple dye baths, and putting the unwoven threads on a loom, the actual weaving can start. Each completed, hand woven ikat represents a colossal amount of creativity and human labor. 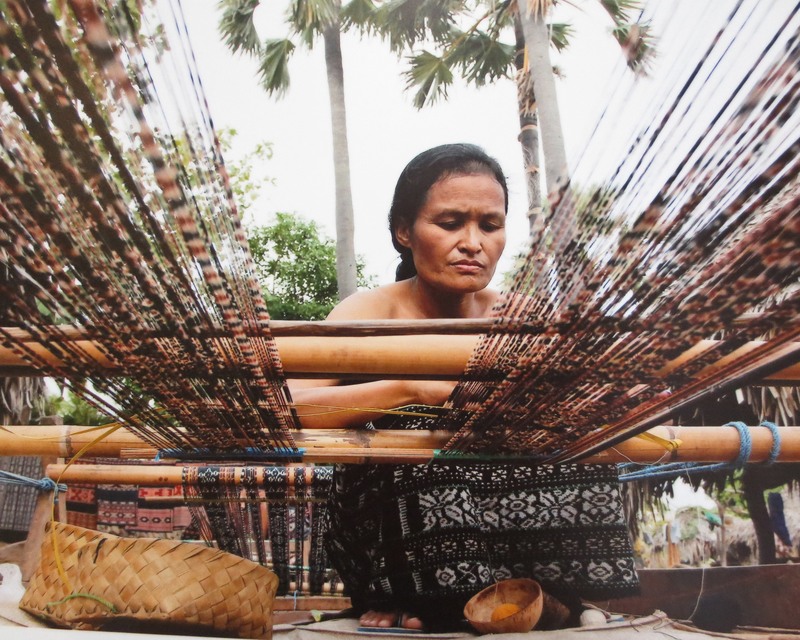 Ikat textiles have been used across the archipelago for countless generations and multiple purposes. The designs created by this intricate process can speak, announcing island, and even village and sometimes family of origin. Ikat patterns can signify rank, provide backdrops for important ceremonies, and be gifts that create connections between families. These textiles are used to heal the sick, cover the dead, unite a wedding couple, and be symbols of deep emotional connections between generations. Look around you: ikat designs can be bold or delicate, brightly colored or somber, abstract or pictorial, blocky or graceful. Understanding this complex process can lead to knowing what to look for in an ikat textile. As the artist weaves, the design emerges, and, if the tying was done well, the dyes were good, and the weaver is skilled, the resulting cloth is clear, with deep color and a pleasing, well balanced design. The nature of the ikat process makes it very difficult to create a lot of detail and curving, graceful designs, so a truly spectacular ikat textile will have clarity, complexity, rich color and an arresting presence that is truly a masterful and significant work of art.